What excited you about this script? How did this influence your approach to directing the play? When I first read the play, I was completely and utterly captivated by the language and the story. I thought to myself: this is an American writing this way, it’s so different, it’s so unusual, and incredibly poetic. And I think it was the poetry, and how the story took you one place, and yet it veered off and took you another place. That challenge of a play, and how to put it in space, excited me. I thought, this is something I’d really love to get my hands on. Tell us about this play’s relationship with the audience, being participants vs. spectators. When Tori was in grad school, her head of the playwriting department asked her, “If there was a writer that you really did not connect to, or did not necessarily like, who would it be?” And for her it was Bertolt Brecht. One of the things that Bertolt Brecht works in and is most famous for is something called “alienation.” Alienation is sort of an effect of theater where it asks you to remove yourself in some way from the process as a spectator, and perhaps make yourself more of a participant. There’s an Italian theater practitioner named Eugenio Barba who I love — he’s somebody that I’ve spent my career trying to make plays around, his dramaturgic way of thinking. He studies this thing called ‘concatenation,’ which is how plays go up and down, up and down... and move within a simultaneous platform. Tori writes that exact way. You think you’re going one way and then suddenly you’re veering off, as I said before, into this other direction. I was interested in finding a way to bring those two forms of theater together. Because of how she works and writes, Shakespeare is very much of the vocabulary in terms of how her words work on the page and how you make them three dimensional. So I was really interested as well in looking at how the language and poetry and breath work in relationship to those other two theater practitioners. My approach was a combination of a bunch of different theater ideas, and trying to put it all in this space. What is the story behind the set? How are “pretty” and “ugly” represented in the design and direction? Think about the title. As a director, one of the things that you always want to do when you’re approaching a play is to continually go back to the title. So what does that mean? If pretty hurts, ugly must be a muhfucka? How can ugly be a muhfucka if pretty hurts? How does pretty hurt? I was really interested in what pretty was in relationship to what ugly might be. Or what is ugly in relationship to what pretty might be? Scenic Design by Louisa Thompson and lighting design by Matt Frey. The set designer (Louisa Thompson) and I, along with the lighting designer (Matt Frey), spent a lot of time examining the play, and we actually ended up starting at the end. There’s something in that final scene where one of the characters asks herself to examine her own ugly in relationship to pretty, and in so doing I thought, what does that look like? I instantly went to one of my favorite grandmothers, who had this beautiful vanity when I was growing up. She would constantly look in front of the vanity, and she would say things to herself about herself. This is something that Tori is examining in this play, and my grandmother was doing it. How would a vanity work in relationship to this play? So we started there. There’s a wonderful moment in the play where one of the other protagonists talks about her mother keeps her in a container and she feels contained and trapped. So how could we make a world that felt contained and trapped with a bunch of bulbs? Then of course there’s this wonderful circle that’s in the middle of it, that’s a raised circle, which in the African and African American tradition circle is an iconic image for us, it’s something that we constantly come back to, as I know it is in many cultures. I was really interested in that form of storytelling, and how we use circles all the time. It’s a very bare set. There’s no furniture, very few props. Really what we’re examining are bodies, these beautiful black bodies in space, and how they tell stories. Costume design by Dede Ayite and hair and wig design by Cookie Jordan. Photos by Joan Marcus. What’s your story of realizing for yourself “I am Queen”? In my family my nickname was Princess. It was never Queen, it was Princess. I went through my early years as a Princess constantly wondering, what does it mean to be a Queen? How do I re-examine and own Queendom? Where do I find that? And then suddenly, this beautiful exquisite Black woman was in the White House. She was the lady of the country. She was very regal, and very Queen-like. She was a Queen. I’d just nearly hit forty, and I thought — here’s this beautiful woman who owns herself. If she’s doing it, I should be doing it too. Every other woman of color, and every other woman for that matter, should be doing it. You really did see this transformation once Michelle Obama took office. With women going back to natural hair, women not wearing makeup as often, women owning themselves in the gym and not being afraid, and not hiding, allowing their bodies to be seen. That means I am Queen, as far as I am concerned. Owning yourself from the inside out. Michelle did that, and from that I really took that to heart, and have since really owned it. She’s an exquisitely powerful woman, and I think we should really allow ourselves, no matter what age you are, to think about her and to think about how she was once one of us. 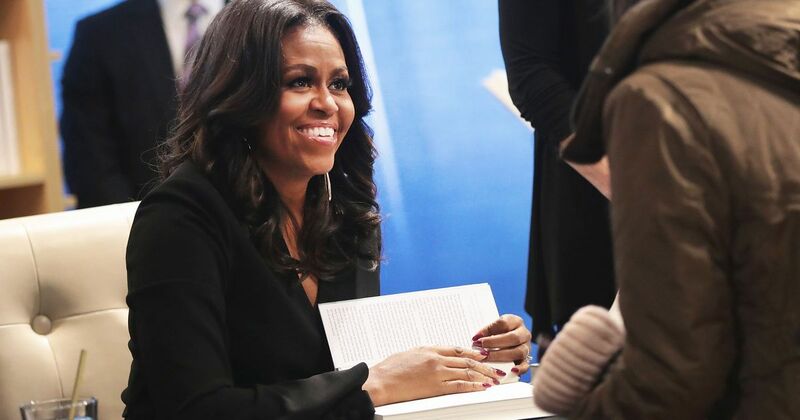 She went to school, she got her law degree, she was educated, she came from a very difficult background, and then became the lady in the White House and owned that without fear. Ultimately I think that’s what being a Queen is — really going through your existence in life without fear. What is there to fear?